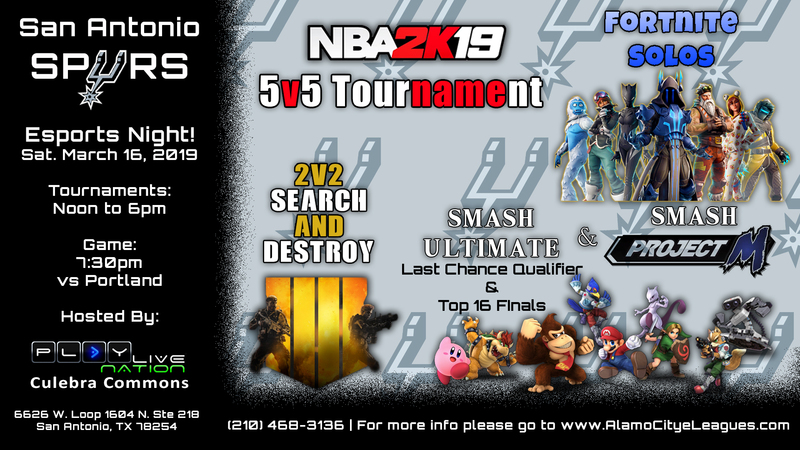 Saturday March 16, 2019, Spurs Esports Night where we bring you some awesome tournaments and game play! First 100 people to pre-register get the Spurs Free Throw experience at the end of the game where you actually get to shoot a free throw on the court. Total Prize Packages worth $1,000.00, Registration includes entry to the Tournament, Free Spurs Swag and a Ticket to the Portland Game at 7:30PM. Tournament winners also get their name's shown on the score board at half time, upgraded seating and the chance to win a Signed Lamarcus Aldridge jersey!! Registration ends on March 5th @ 9PM. Tickets may be purchased online or at PLAYLive Nation Culebra Commons!! New Shopping area so GPS can be off. We are off 1604 and Culebra, inside the loop next to HuHot. We are across the hwy from Walmart.